One key item in the success of implementation is your people. Their ability to adapt will greatly impact how the project progresses and its ultimate success or failure. You will also need complete support from management. Implementation requires an allocation of resources, time, budget and equipment. How much of each depends on the defined scope of the first phase of implementation. Defining scope at first will feel a bit overwhelming. There are many areas of your company that will be impacted during the transition. Process planning, Project Management, Purchasing, Vendors and Manufacturing just to name a few. With such a large area of impact, it's best to start small and build outward. Implementation could begin with Engineering, Manufacturing and Quality. This will keep the major impact internal as people are trained on the process. Implementation could also begin with Design Engineering. 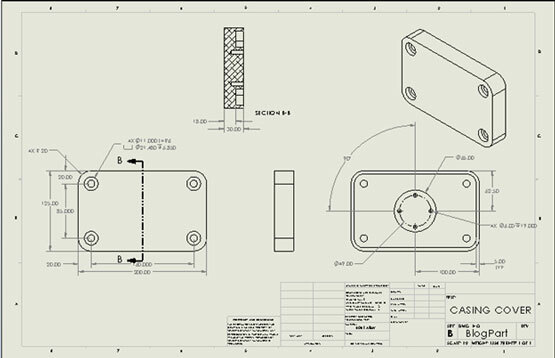 MBD can be used to add PMI to models and the views created can then be added to your 2D drawings. This can work as a great place to start that will have minimal impact to other areas. See the chart below for examples of how departments may be affected. With the initial scope defined, we are back to the most important part of the implementation—people. The stakeholders will need leaders in each key area to be on board with the change and be passionate about the concepts and goals. The team will also need an overall leader who is empowered and whose key function will be to drive change. It is important to include performance indicators to help measure success throughout the process. A very good comparison performance indicator is measuring the amount of time the current process takes compared to MBD. Set goals of what is expected as a result of implementation and use them as measurement to determine progress. As with any change, resistance will be encountered throughout the entire process. The key is to focus on measured successes defined by your performance indicators. Cultural drive should come with time and the desire to continually improve something that matters. Stay tuned for more from the MBD series! Thanks for checking out the Alignex Blog! For more information about Model-Based Definition, check out our resource center below!